Why Use Research Quality Instruments? 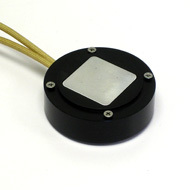 ATS’ HP-97™ Series are high-power component simulators used for replicating the heat dissipation conditions of devices. It features a 32 x 32 mm Aluminum block and a cartridge heater embedded within a high temperature DELRIN® housing and mounted to an FR4 plate. DELRIN® is known for its stiffness, dimensional stability, impact resistance, and structural strength. Typical applications for the HP-97™ Component Simulators include heat sink characterization and side-by-side heat sink comparison. Each Component Simulator has a temperature range of ambient to 110°C, ideal for most heat sink testing applications. Each unit is designed to fit within most Advanced Thermal Solutions, Inc. bench top, open loop and closed loop wind tunnels. Heat sinks are mounted to the component simulators via double-sided adhesive thermal tape. Custom attachment options are also available. A power source is required for operation. Thermal tape and power source are not included.